Learn how to setup and use the Moodle cms platform used by educational professionals, universities and colleges in our 5 part video series. 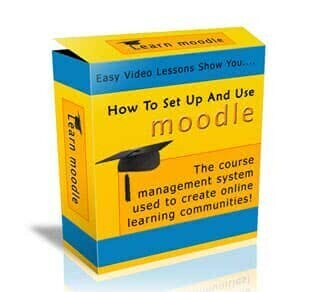 Moodle is the ultimate e-learning system. this five part video series takes you by the hand and shows you how to get started. On line communities and e-learning have exploded over the last couple of years. Everyone can take part in this new way of communication and learning by using free “Open Source” software. One of the best – from a teaching and learning prespective is Moodle. Moodle is a free open source course management system. It is extremely flexible and powerful . Moodle is widely used by Colleges and Universities to teach students in an e-learning environment. It can be used in other ways as well. For instance it could be used in a marketing capacity. Instead of creating an ebook you could actually create an on line course. This would work in any niche. Moodle is easy to install and set up and is also easy to maintain. Within a couple of hours you could have your on line learning community set up. Imagine the professional image you will portray when you set up a professional looking on line course. Your students would certainly be impressed with their purchase. Since Moodle is a free open source program you could set up your learning environment without spending any money other than a domain name and hosting. This allows you to reap huge profit’s from your site. Your overhead is virtually zero so your profit’s will be extremely high. The video series consists of five videos and is a little over ninety minutes long. Once you watch the videos you will have a good understanding of the basics of Moodle and will be able to set up your own on line community. How to set up courses. How to change the look of your site. How to add functionality to your site using modules and blocks..
And everything else you need to know to create your own teaching environment. Now Is Your Chance To Become an Online Instructor and start reaping the rewards that come with it! Don’t put it off any longer. Two hours from now you could be creating your own on line courses.